Ngapali is one of the most beautiful beach on the world. It is situated 7km away from the Thandwe; as well-known as Sandoway, British Colonial City, and also called Dwayawaddy,ancient city of Rakhine. It coast was 12 kilo-meters long. It is the most famous beach in Myanmar (Burma) and is a popular tourist destination. Ngapali Beach is about 55 minutes flight from Yangon. By overland, there are two different ways from Yangon. One is passed through Pyay, Ayarwaddy River and Rakhine Roma and it will take about 14 hour to drive. You can see a lot of natural beauty. Another way is from the Ayarwaddy Division and it will take about 12 hour to reach Ngapali. Ngapali Beach is located on the Bay of Bengal with its white and clear water. The best time to visiting Ngapali Beach is from October to May. Although Ngapali is for relaxation and enjoying the sun, there are a lot of activities like snorkeling, fishing, trekking, bicyclin and golfing, e.t.c. You can also explore excursion yourself by renting an e-bike. Riding motorbikes is not allowed for foreigners by Gorvernment, even with an international driving license. Burmese driving license is required. Ngapali is not expensive to go. Accommodation in Ngapali Beach like all over the world is a matter of choice and fit every budget. You can find clean and comfortable accommodation from 3 to 5 stars (luxury) Hotels and Lodges. Stays usually include breakfast. There are a lot of natural beauty you can find if you do not hang on excursions. Almost all the hotels offer bicycle for rent.So it is easy to explore the nearby area. We recommend that to go on the early morning tiime. We believe that our website can give you the best Ngapali Travels Information. We need investors who can invest USD 5000 for Additional Fee like Airline Deposit to contract for flight tickets and Like hotel contract deposit. We aim for the people whoever come to Ngaplai to get smoothness and easy going for their trip. We believe that we can give a hand for everyone who comes to Ngaplali. 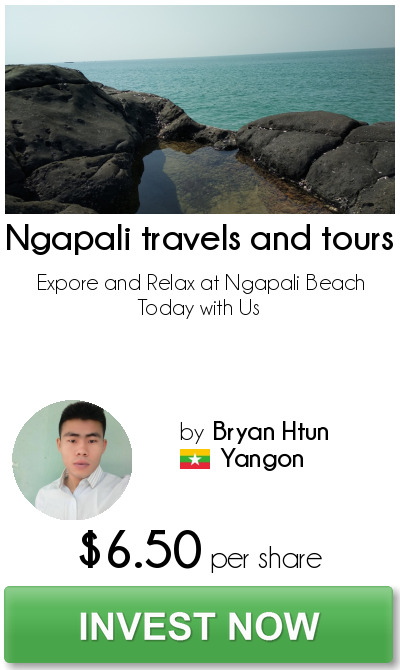 I am Bryan, Business Develop Manager at Ngapali Travels. We are tour service agent in Ngapali Beach, Myanmar. We arrange tour package like honeymoon trip and we arrange local tour activities. We believe that we can give a hand for everyone who comes to Ngaplali and we can give more revenue to our investor within 3 years. Above photo is my prove of business. The total number of shares, which this project is authorized to issue is ten thousand two hundred and thirty (10,230), each with a par value of $2.00 USD.